There are always pleasant surprises often hiding just under something else on tables at garage sales and thrift store. DH found this oval Chintz that I had not noticed as I scanned and walked past a 'loaded with treasures' garage sale table. DH was following and found it. This often happens when we are out 'shopping' at thrifts and garage sales, what one misses the other finds. It has been a bit of a search online to find 'more' about the dish. 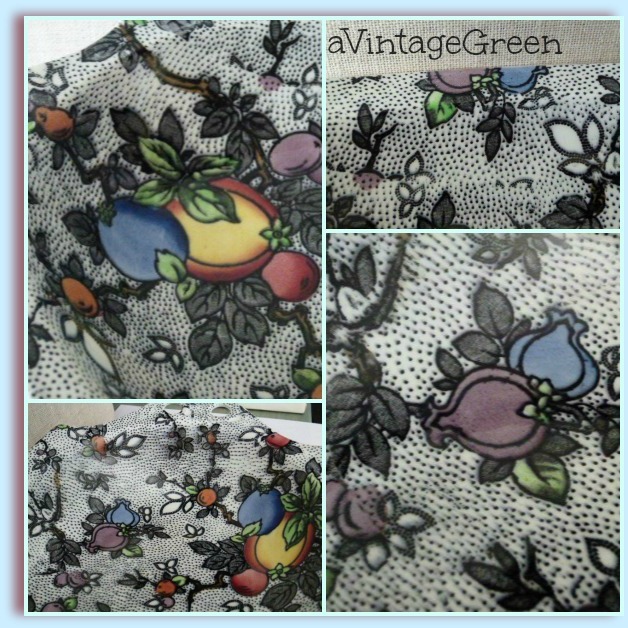 Thought I would include close ups of the various fruit and designs for the Pomegranate pattern. 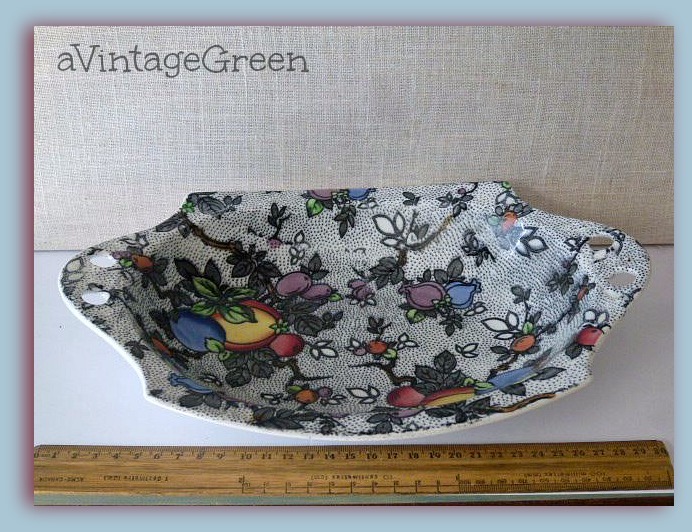 This Chintz oval tab handled bowl called "Pomegranate" by Leighton Bourne & Leigh Ltd, Made in England. Number 4113 was most likely produced in the 1930's. 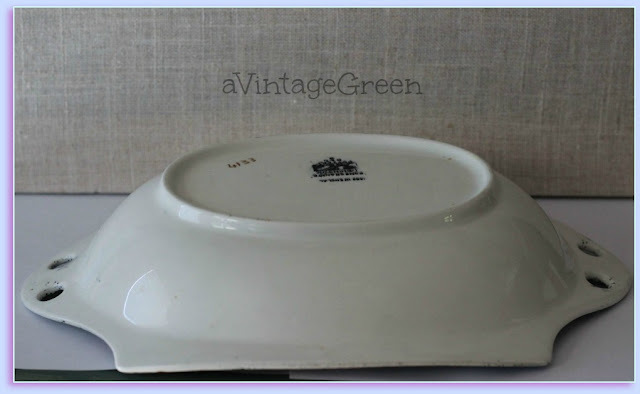 I found one reference and picture of a Leighton dish here: Leighton Bourne & Leigh Ltd Dish c. 1930. Check the link back to see that dish. Chintz patterns have long been a favorite collectible of mine. Its always fun to find a chintz piece when out hunting. Always something new to research. It is my 66th Birthday today. 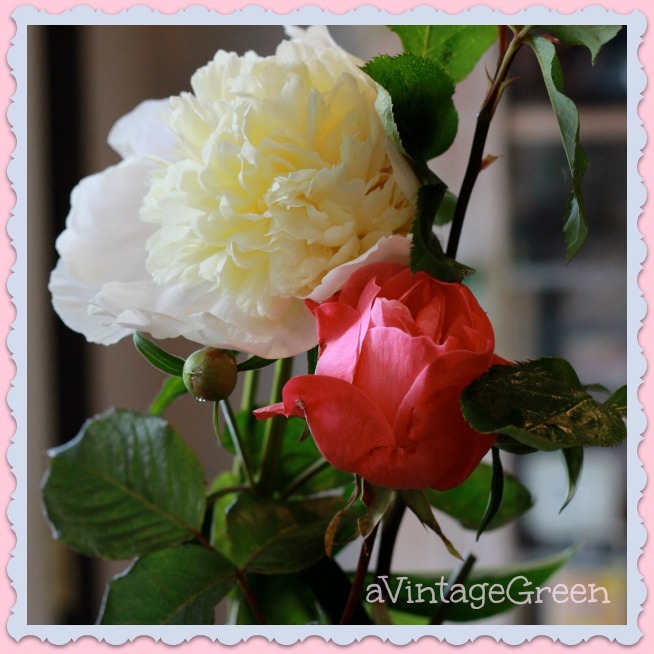 Peonies and Roses are my favorite flowers. Its been a year of changes; health issues, life changes. Friends and family are so very important. Lovely find and adore the beautiful pattern. Happy Birthday to you too! Have a lovely day! Beautiful find. Love that dish! Happy Birthday to you - hope you have a wonderful and fun filled day! Happy birthday! Enjoy. I loved learning about this unique dish! Love it. It's very special. Have a great birthday Joy! Nice find. A very happy birthday to you! It is good to have friends and family for support through all that life throws our way. How fun to find Chintz! Peonies have really become a favorite of mine, too. What a beautiful design...I've never seen one like it! I know you are proud of it! Hope you gave hubby and big hug! Happy Birthday!!! I hope you are enjoying a beautiful day!!! Happy Birthday to you! I love the dish, what a great find. Kudos to your hubby! Have a great day and week ahead. Happy Birthday, Joy. I hope you have a wonderful year ahead. 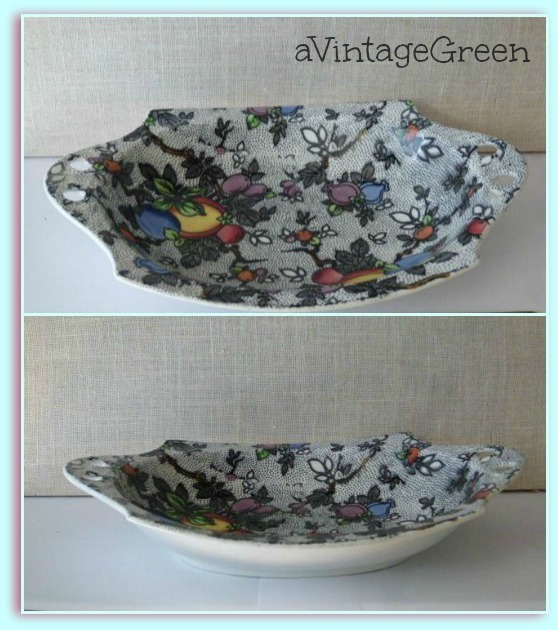 Such a pretty dish, with a unique chintz pattern. A perfect dish and a perfect to find it in time for your birthday! I am only a year behind you! You better watch your back! I'm catching UP!! I really do enjoy your blog AND your brother's! You are both clever and so creative! Love that dish. Happy birthday from Scotland! My friend Sally and I used to do the same thing with antique stores, yard sales, and flea markets only we were looking for vintage glass Christmas ornaments. 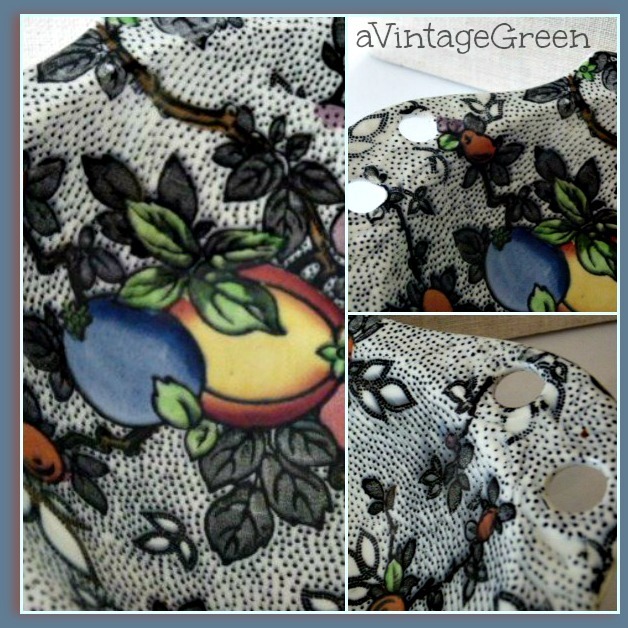 This is such an unusual piece and I love fruit themed patterns. 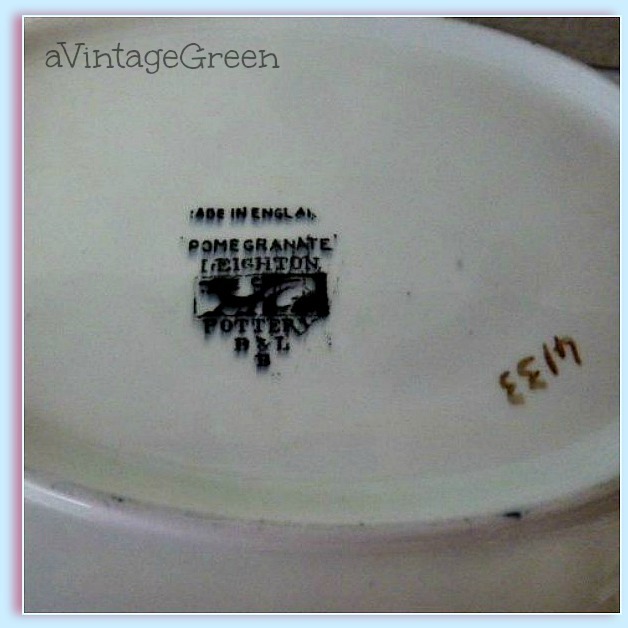 I have an old English pattern of dinnerware that also features pomegranites. Now you have me wanting to take them down and photograph. Happy Birthday and everything good in your new year. That is just beautiful! Happy Birthday! Beautiful piece -- the pattern has kind of a modern appeal, doesn't it? Happy birthday! A most unusual and interesting find. Happy Birthday to you! Chintz is one of my favorites as well. I am not familiar with this pattern...isn't it a thrill to find a treasure! A belated happy birthday, Joy! I hope your birthday week has been filled with fun and laughter!